The wisdom of that route started to be questioned, though, as we reached Avellino – and spent over an hour sat in lunchtime (school run in Italy…) traffic trying to find a route, any route, out of town. Even a route in the right direction was becoming negotiable. The timing didn’t much help – we know by now that, if lunch is late, any issues get magnified as we get a bit snippy at each other, so by the time we escaped we were growling at each other almost as loudly as our stomaches. As we started to approach the urban sprawl of Napoli, with the bulk of Vesuvio looming imposingly, any lingering doubts as to this being the wrong route were thoroughly confirmed. The outer satellite towns were plain godawful. Rubbish piled high, abandoned buildings mixing with corrugated tin huts like something out of South African shanty towns – and, just to remind us gently of the fact we were getting into Godfather territory (The Camorra for Napoli), the odd bit of conspicuous wealth – a Maserati parked outside a scruffy small shop, then a Bentley carving through traffic. 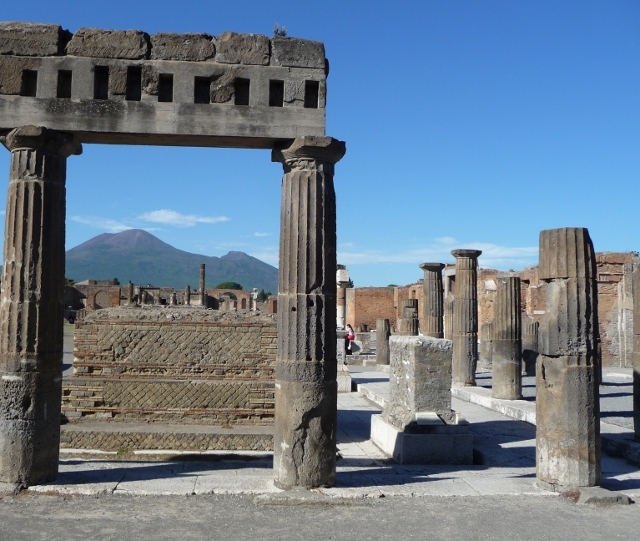 The ruins of Pompei are huge – the town itself isn’t completely excavated, but most of the space within the walls has been. From the entrance by the Forum to the Amphitheatre at the far end must be a good half hour walk. There’s information leaflets giving suggested routes of various lengths, but we treated the shorter routes more as warnings of heavy tour-group congestion than anything else! There’s a real feel in the city of what it must have been like. Not many of the buildings have much left vertically, with only the odd roof and column over much of the site. The ones that are more complete, though, are massively evocative. The baths, the theatre, the amphitheatre, the “House of the Faun” – some real gems, although you definitely got to the point of wandering streets barely looking at the more ordinary ruined buildings on either side. In a way, that helped to reinforce the fact that this had been a real live city, not just a few isolated buildings. 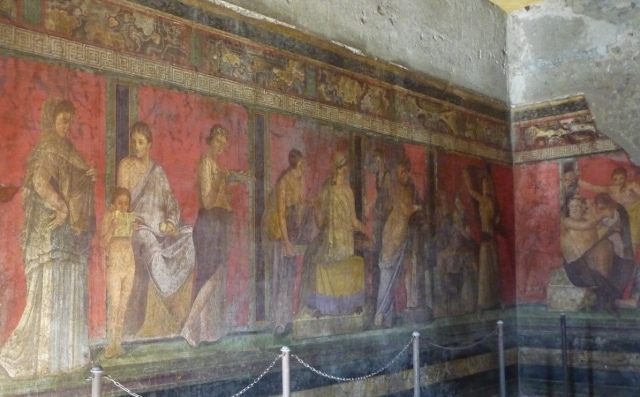 On one edge of the city, outside the walls (but inside the site boundaries) was the “Villa dei Misteri” – a substantial house, very well preserved, with intact and colourful frescoes depicting the initiations of a young woman into one of the “secret societies” that flourished underground in the city. The myriad of personal stories involved were also reflected in the presence of some of the recovered corpses. A couple were on display in glass cases just off the forum, but the single most poignant was lurking in a shady and dusty storage area, behind iron grilles. 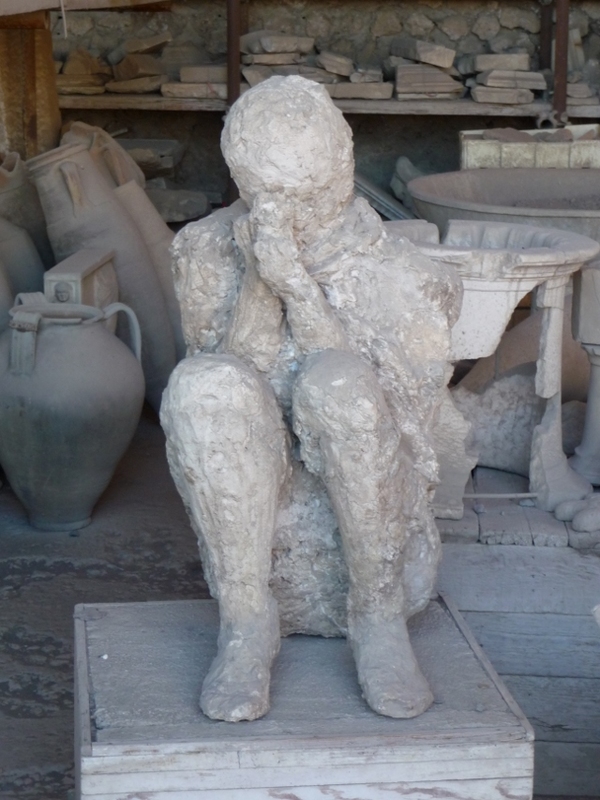 Surrounded by smashed amphorae and other bric-a-brac was a corpse of a person sitting up, cowering, with their hands up and covering their face. Life, interrupted. The great size of the site meant that any kind of effective guardianship would have been near-on impossible, but the total and utter lack of any staff once inside did catch us by surprise. Some people seemed to regard this as a bonus, especially the Israeli woman who we saw dipping into one of the buildings for a pee, despite there being plenty of public loos available. 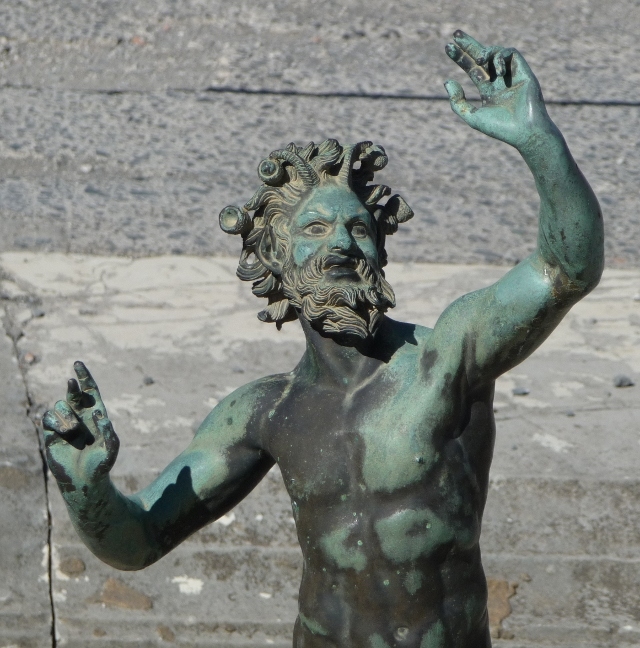 Napoli itself was exactly what we expected, a total contrast… A city full – overfull – of life. Ellie reckoned it felt like a cross between an Indian city and New York in the ’80s, before it was cleaned up. Leaving the station into Piazza Garibaldi, a massive building site full of traffic and people and noise and bustle and chaos, we headed towards the Forcella quarter. 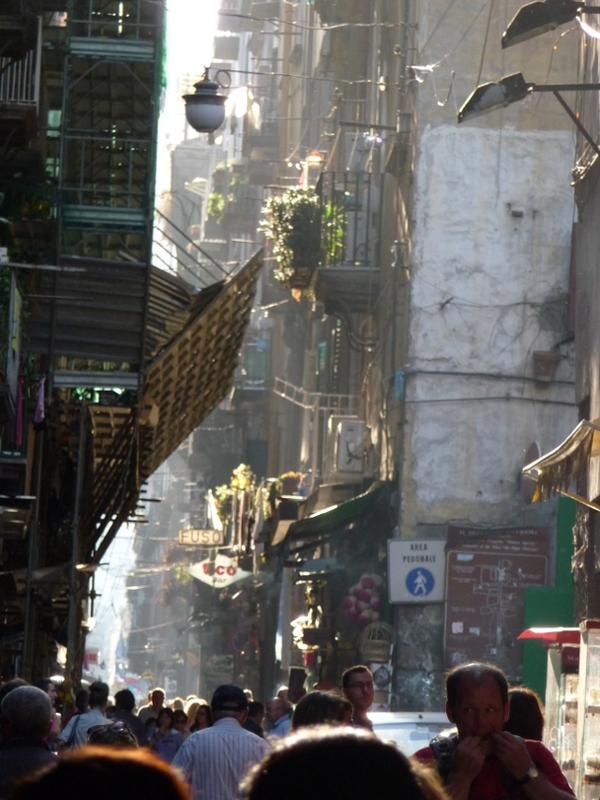 The heart of the old city, it’s a maze of narrow streets with tall buildings shading any direct sunlight from reaching the washing hung several stories above your heads. People threaded through the blankets covered in hooky designer sunglasses and handbags, somehow avoiding the scooters seemingly buzzing in several different directions at once. What else to do for lunch in the home city of Pizza, than to find a superb example? And we did. 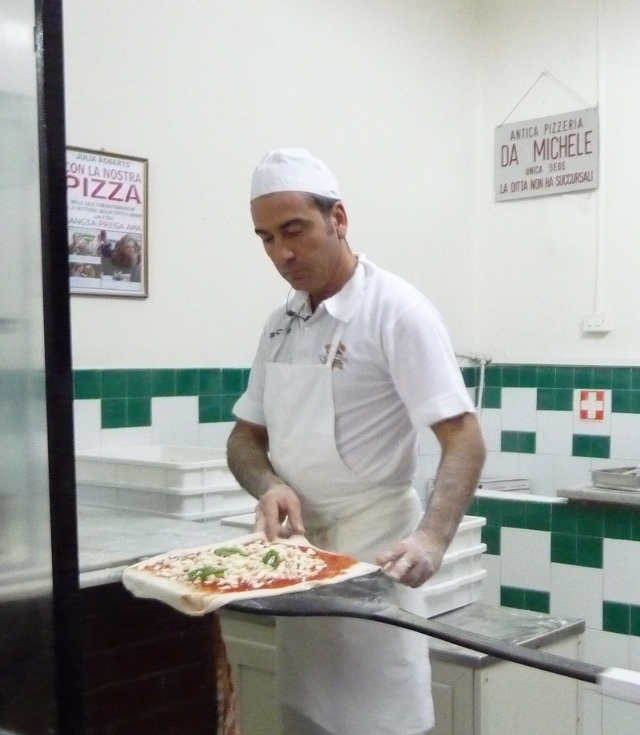 There are several Pizzeria known for being almost reactionary in their traditionalism – and the one we found, Da Michele, is apparently a fine example. It certainly did us proud, once we’d figured out the table etiquette (go in, tell the guy at the till how many in your party, then wait in the throng outside the door for your number to be called – once, and once only…). The menu was far more straightforward. Marinara (tomato, garlic, oregano) or Margherita. Small or Large. Beer or no beer. End of. The result was predictably delicious. The chaos of the city continued when we arrived at the archeological museum, home of many of the best finds from Pompei & Ercolano. 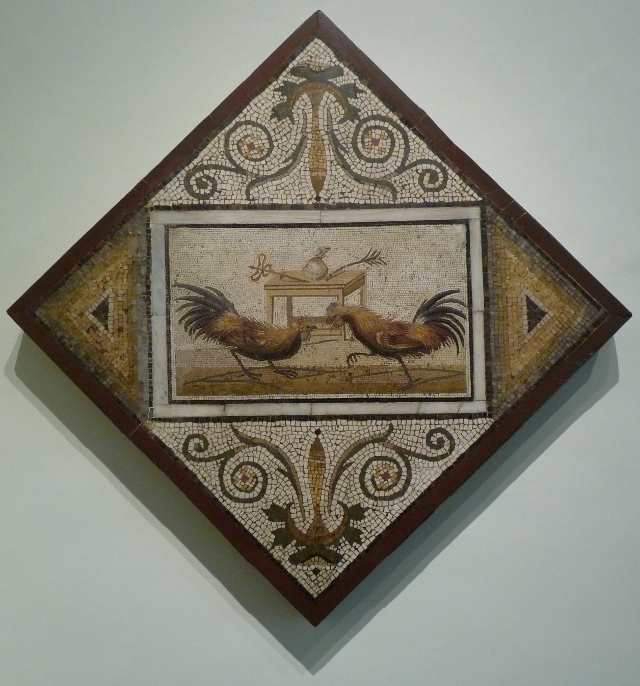 Many of the mosaics and frescoes still on site at the ruins are copies, with the originals preserved in the museum. I’m not convinced that “preserved” is the correct word, since the floors in a couple of the rooms had collapsed, leaving large holes protected only by flimsy barrier tape, whilst in another room, the decorators were hard at work on the window shutters – barely a metre or two from priceless works… Then, of course, there’s the “secret room”. 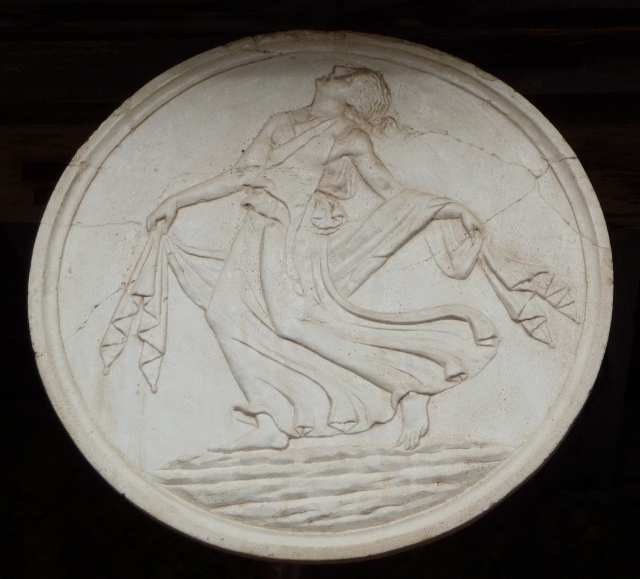 It’s not the best-kept secret in the world, just follow the tour groups, and you find yourself surrounded by ancient Roman erotica and phallic talismen, deemed unsuitable for unfettered public access for many years. From the comical grotesque and massively over-endowed stone dwarves, to the beautifully carved marble statue of Pan “enjoying the attentions” of a goat – with no detail spared – it’s no great surprise that the 19th century aristocracy were a bit wary of their wives and servants being allowed in. 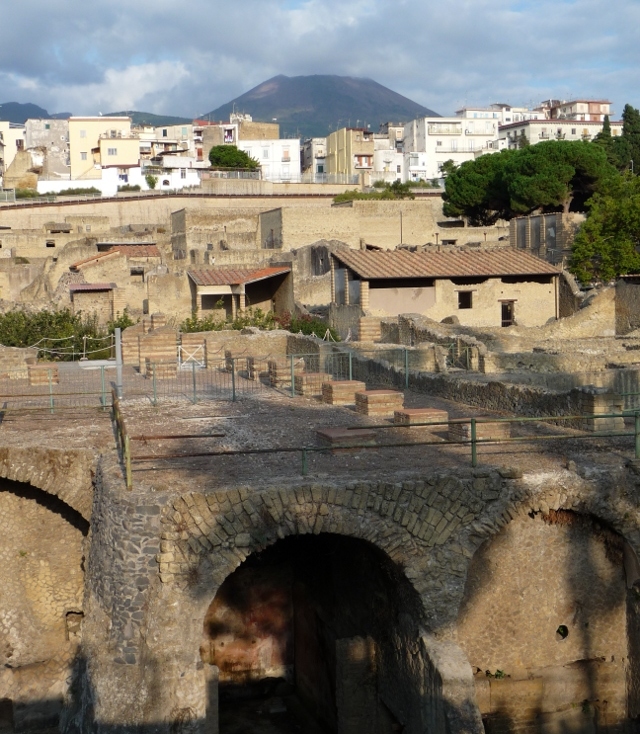 After a substantial scrambled-egg farewell breakfast with Philipp & Melanie, we headed to the other town killed by the volcanic eruption at the same time as Pompei – Ercolano. It’s a very different affair to the better-known neighbour, a small residential town rather than a large commercial centre, and much less excavated. That’s primarily because it’s surrounded by modern residential suburb, with concrete flats right on the edge of the site. The location gives a much better feel of what’s meant by “excavation”, with the ruins surrounded by cliff-faces of earth up towards the present-day surface level. 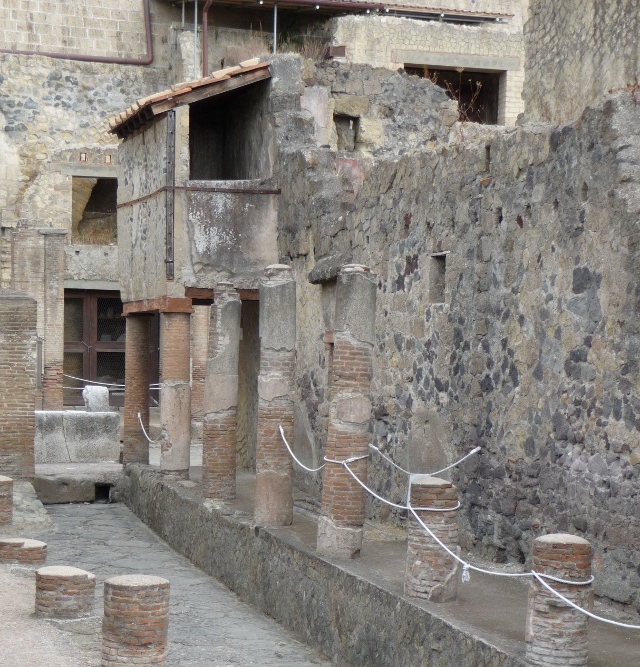 The houses are much better preserved than Pompei, too – multiple floors still standing and, in some cases, original wood still intact, carbonised by the heat of the volcanic mudslide, but still clearly identifiable, even the wooden partition doors of one house. Unfortunately, the “House of the Carbonised Furniture” was closed for restoration when we were there – a massive ongoing project, the difference between our roughly decade-old guidebook’s description and the current situation is clear. At the time the book was published, about two-thirds of the structures were unsafe to enter. They’ve been restored to the point that very few are now closed off, although signs around still warned of ongoing deterioration from visitors themselves – backpacks and bags scuffing frescoes, walls crumbling from being sat on. This entry was posted in By Country - Italy, Food stuff, Travel stuff. Bookmark the permalink.